I love this new game for the UK Department for Transport, produced by AMV BBDO. Nicola from AMV tells me "The “Driving Challenge” builds upon a film made by the University of Illinois 10 years ago to demonstrate the psychological principle of inattentional blindness. 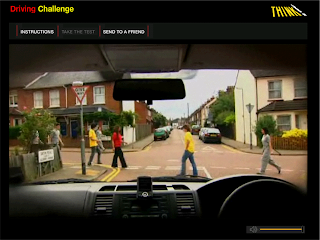 Essentially, the interactive game uses this concept to directly demonstrate that your driving is impaired when talking on a mobile phone, either hand held or hands free. In fact, the game reveals that if you use your mobile phone whilst driving you are four times more likely to crash! Its whole aim is to encourage drivers to be more vigilant." Give it a go - I didn't pass, but can you? Thanks for the post Dan! I can only hope that more people fail and think about the dangers of driving and talking on your mobile. Just seeing this game for the first time today. Sorry for the delay. Are you kidding me? This game has absolutely nothing to do with driving. If you are driving you don't count pedestrians for points -- you try to avoid hitting them. To score this game correctly you should get points for tuning out the cell phone questions at a critical point in the intersection and for avoiding the pedestrians --not counting them. You start counting people for points on the road and someone is going to die. A high score should look more like -- zero for counting pedestrians and the number of questions asked when not directly approaching the intersection. I guarantee if you play this game like you are suppose to be driving, not like you are supposed to be counting people for points, you don't miss the waving rabbit. Stupid application for this game --irresponsible promotion for something it has nothing to do with. Who should I support at Euro2008?